To understand the issues that define this extraordinary moment in American democracy, on Thursday, October 12, 2017 the Munk Debate will move the motion: Be it resolved, American democracy is in its worst crisis in a generation and Donald J. Trump is to blame. Arguing for the resolution will be the contributing editor at New York magazine Andrew Sullivan, "the most influential political writer of his generation" by the New York Times. He will be joined by E.J. Dionne, a senior fellow at the Brookings Institution, a syndicated columnist for the Washington Post, and a professor in the Foundations of Democracy and Culture at Georgetown University. Tickets go on sale to Munk Debate premium members at 10:00 AM on Tuesday, September 12th. Remaining tickets will go on sale to the public at 12:00 NOON on Thursday, September 14th . 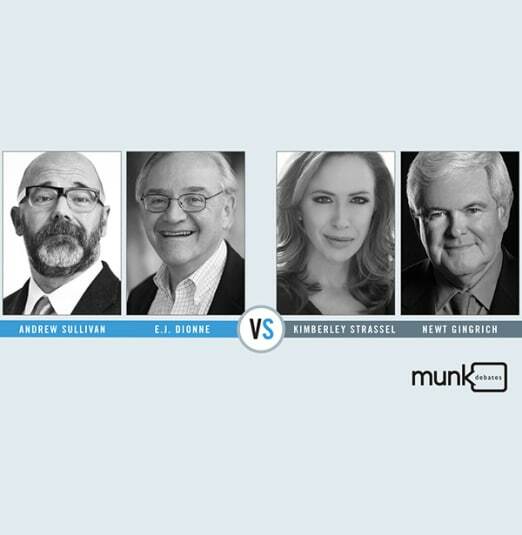 For information on purchasing tickets, or premium membership, please visit www.munkdebates.com.